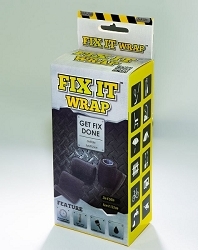 You've seen FiberFix but why pay their high price when fix it wrap is less costly for the same product. Introducing the latest in repair products since the invention of duct tape. So many things are made cheap these days. Everything seems to break so easy. Now there is a better solution than duct tape. Fix It Wrap is a new fiberglass repair wrap that can bind two broken pieces together better than duct tape and stronger than steel. It's also sold much cheaper than competitors such as FiberFix (R) Fiber Fix.